Did you know that understanding color psychology can empower you to influence purchasing decisions? Research conducted by the secretariat of the Seoul International Color Expo 2004 documented that 84.7% of consumers cite color as the main reason for purchasing a product. Used strategically, color is a powerful marketing tool (Mueller). It has the ability to attract and engage prospects and support your branding proposition. Ads in color are read 42% more than ads in black and white (White, J.V., 1997, Color for Impact, Strathmoor Press). 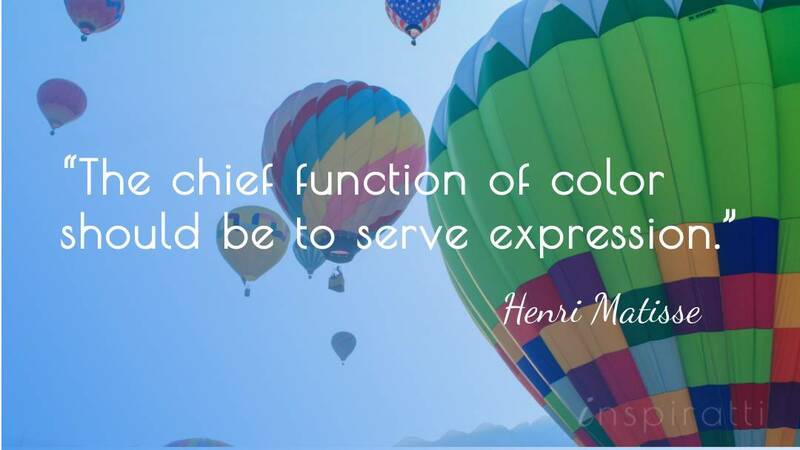 Yet, color symbolism and meanings vary significantly across different cultures. In a globalized world, understanding the global associations carried by different hues is more important for marketing leaders than ever before (Chief Marketer). Some colors show relatively consistent interpretations across cultures. Research indicates that blue, green and white share similar meanings and are well liked across countries (Madden et al). Blue is often considered a universally acceptable color because it has positive or at least neutral connotations in most countries and cultures. This helps explain why Skype uses a blue color scheme for each of its sites globally (Webdesigner Depot). Still, whilst blue is a highly popular color for huge global brands, its popularity wanes outside of North America and Northern Europe: half of the top 10 global brands have blue logos, yet of the top Japanese brands only one brand has a blue logo (Chief Marketer). 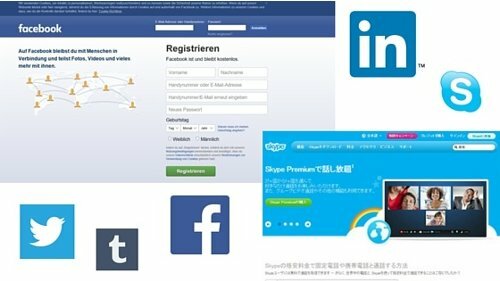 The major social media networks use a blue color scheme, drawing upon associations of reliability, dependability and trust. Blue is also considered the most positive and safest color for a global audience. Green shares many common meanings worldwide, including nature, ecology, and environmental awareness. Yet in many South American cultures, green symbolizes death (The Huffington Post). 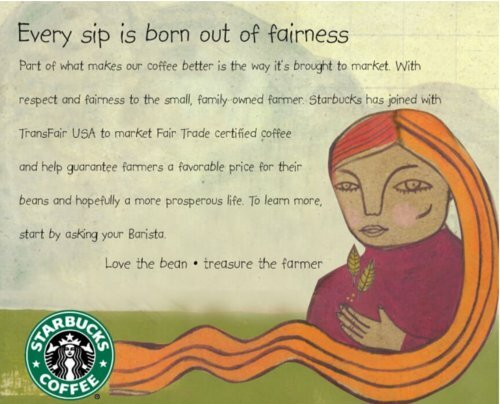 In their Fair Trade campaign Starbucks uses different shades of green to convey sustainability and harmony. This is supported by casual typography and hand drawings that further evoke a feeling of restfulness and being one with nature. 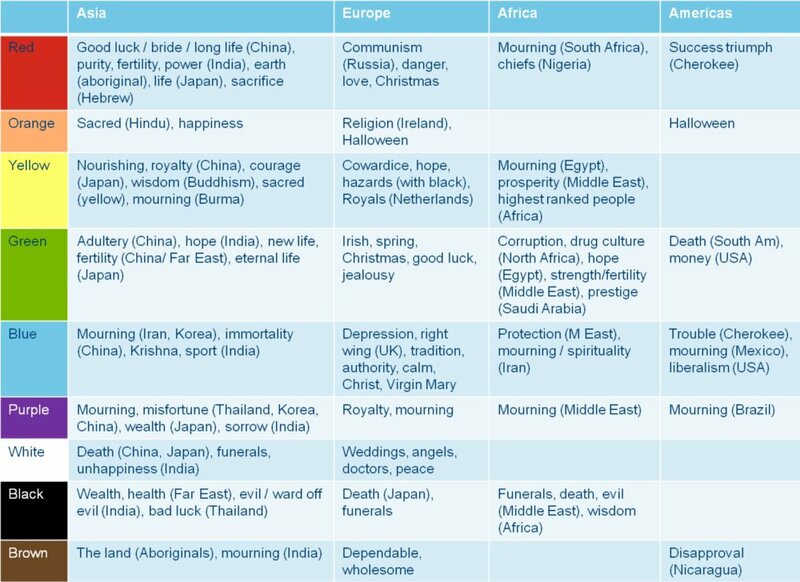 Whilst some colors show cross‐cultural consistency, others hold opposing meanings in different cultures (Jacobs et al). Although black and red are also well liked worldwide, they share different meanings across countries (Madden et al). Purple signifies wealth in Japan, but sorrow and unhappiness in India. Meanwhile, it signifies freedom or peace in France, and royalty in the UK, China and the US (Six Degrees). It would therefore be wise to adopt a cautious approach in the use of colors that have a multitude of meanings across different cultures. This table explores the meaning of colors across different world regions. You should also consider the meanings conveyed by specific color combinations. For example, the meaning of the color red changes when combined with other colors. It symbolizes Christmas when combined with green in Western culture, but conveys joy in Eastern countries when combined with white (California State University). Color psychology need not be intimidating once you gain proper focus. You need to assess the meaning of the specific colors you want to use in the specific markets you are targeting. Conduct research to ensure the colors you plan to use in marketing campaigns will be well received by your target markets (Deseret News). Color is heavily based on individual perceptions. The key is to identify patterns in perceptions and reactions to different colors that enable us to make practical decisions in our color choices (Gregory Ciotti). Consider conducting direct consumer research to get more tailored insights on how color psychology plays out in your target markets. After all, “the best lessons learned about international color preferences come directly from real customers, not books” (Deseret News). After visiting homes of California’s Latino population, IKEA noted subdued Scandinavian color preferences were not bold enough for Latino tastes. IKEA therefore warmed up colors in their showrooms to enhance performance in the U.S. Latino market. Once you understand how color psychology plays out in your target market, you need to consider how you are going to incorporate those findings into the broader marketing strategy. How will you ensure that use of color in your marketing campaigns resonates across cultures, whilst still conveying a consistent brand identity? It is important to select a color palette that represents your product and brand personality, so that you can attract potential customers (Usability). Color that is appropriate for one product can be a disastrous choice for another product. Bright neon and purple colors are fun and high energy and are therefore popular in the active wear apparel in the USA, Mexico and Brazil, as well as in Europe and Japan. In contrast, Lexus uses a limited color palette and a steel gray color to convey the brand’s personality of sophistication, elegance, exclusivity and a high price (Mueller). An international company designing wedding clothes, however, would want to communicate a feeling of celebration and union. While adopting a white color theme would evoke such feelings in most western countries, it may have unintended consequences in other parts of the world, such as Asia where white is associated with death (Sajan). Whilst all colors should be cohesive within the same hues and tones, you could consider adjusting the balance of the colors in your core and supporting palettes. For example, if a particular color in your supporting palette has positive associations in the market you are targeting, you could make stronger use of that color in your call-to-actions and supporting images (Kenney). You should also aim to select different colors from your competitors which will help differentiate your brand (Usability). Indeed, “it’s possible to play it too safe. While blue is generally considered the most acceptable color across different cultures, using too much of it can lead to design fatigue. This is true with any color’s overuse” (Sajan). In fact, many successful campaigns have broken traditional color conventions. Combining opposing colors increases their visibility on the market (Blur Group). Therefore, if you aim to present your brand as forward-thinking and innovative, using a shocking color may have a positive impact with certain audiences and help your brand to stand out from the competition. “Always select colors with your target audience in mind, with an eye toward cultural expectations” (Sajan). Yet, there are other factors important besides culture that should be considered in your color selection, such as personality, age, gender, and psychological factors (Tornetta et al). Different demographic groups will be more receptive to some colors than others. Whilst bright colors may resonate well with a young audience, they may be perceived negatively with an older audience. Smart marketers use color psychology to influence behavior. “What is the idea, feeling or call to action that you want your marketing campaign to engender within your chosen audience?” (Sajan). Whilst warm colors influence consumers to take action, cooler shades have a calming effect (Blur Group). Fast food restaurants and clearance sales use stimulant colors such as red, orange, and black to illicit a sense of urgency in impulse shoppers. Restaurants frequently use red in their advertising as the color evokes strong emotions and stimulates the appetite e.g. McDonalds, KFC, Pizza Hut (Inc). Meanwhile, clothing stores use lighter colors such as pink and sky blue to evoke a calm, soothing experience for shoppers who prefer to shop at a leisurely pace (Tornetta et al). For their global “Taste the Feeling” campaign Coca-Cola’ incorporated red into the beach towels, outfits, and nail polish used in their print ad to complement their red logo. 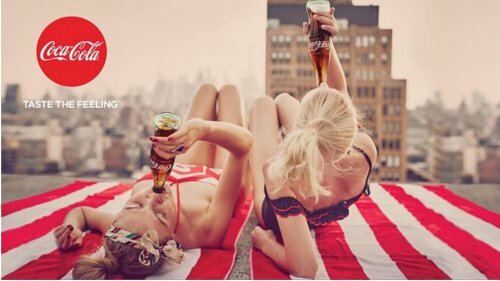 The eye-catching imagery of the models drinking their refreshing soft drink makes you want to buy a bottle of Coke. Should you adapt your color palette for each geographical market that you are operating in? Whilst some brands adopt a standardized approach to use of color across different cultures, other brands adapt their color strategy for international markets. Sticking with your brand’s original colors supports brand continuity across cultures. Coca-Cola makes consistent use of the brand’s iconic red color across their websites in Egypt, Australia and other countries. Nevertheless, if your existing brand colors are not well-received in the target market, it may be wise to introduce other, more culturally acceptable colors into your global marketing campaigns. In any case, “the goal is to select colors that will help your message resonate in every market” (Sajan). In fact, sometimes adapting your color palette across different geographical markets can better support your positioning in a specific market. For example, McDonalds uses a hunter green backdrop in Europe instead of the traditional red color used in the US in order to support an eco-friendly image in the European market where environmental concern is higher (Six Degrees). Comparing McDonald’s websites in the US and Italy – McDonald’s uses green to support an environmentally friendly image in Europe, and red to stimulate the appetite in the US. When meaning associated with a color is different across cultures, pursuing a customized color strategy can be beneficial (Mueller). Not adapting color according to the target market can have detrimental impacts to the performance of the brand in that market. In the 1950s, Pepsi lost its dominant share of the beverage market in at least one southeast Asian country after changing its vending machines and coolers from a deep regal blue to light ice blue. Why? Light blue is associated with death in that region, and Pepsi’s subsequent loss was competitor Coca-Cola’s gain (Deseret News). Fortunately, other brands had more foresight in use of color which enabled them to escape huge international marketing blunders. Orange launched a highly successful ad campaign using the slogan “The Future’s Bright – the Future’s Orange.” In Northern Ireland, Orange had to modify the slogan where people strongly associate the color orange with the Orange Order. Without adapting the campaign, the meaning conveyed might have been “the Future’s Protestant Loyalist,” an assertion that would have unintentionally annoyed the Catholic portion of the population (Deseret News). “When used strategically, color can propel your global brand and core message to the heights of global recognition and intercultural success” (Sajan). Color is one of the most important and impactful elements to consider when marketing your brand in international markets. Whilst understanding color meanings and associations across different countries shouldn’t restrict the creativity of your global marketing campaigns, it should certainly inform your decisions over color selection. Although universally accepted notions of color exist, there are fundamental differences in the meaning and preferences of color across cultures. “Using color isn’t an exact science. The key is to test, measure and adjust your efforts” (Act-On). Through this process, you will determine the colors that best attract, resonate and convert your target audiences. With a blueprint for color success, you can continue to iterate across time and as you enter new international markets. Do you consider color psychology in your marketing? How do you use color psychology to increase the impact of your marketing campaigns? How important do you think it is to localize your color choices to different international markets? Share your thoughts in the comments below.